Now you can access your up-to-date COI online whenever you need it. Providing integrated service solutions like this has made GreenRoad Insurance a recognized insurance agency dedicated to building long-term, rewarding partnerships. Based on a combination of innovative technologies and a deep understanding of our clients' business goals, our partnership with Service 24/7 enables you to experience greater efficiency and productivity. This value-added support system is designed to provide you with immediate, round-the-clock certificate management service. Certificate delivery methods include email, fax, and U.S. Mail. Records are then stored in a security-protected searchable record-keeping archive. Your Certificate of Insurance is now available right at your fingertips! Simply log in here to receive and print your certificate. Looking for Insurance? 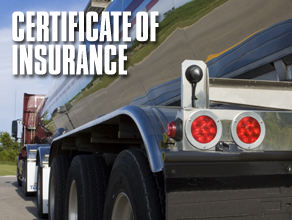 If you're looking to buy fleet or trucking insurance, get in touch with one of our agents today.